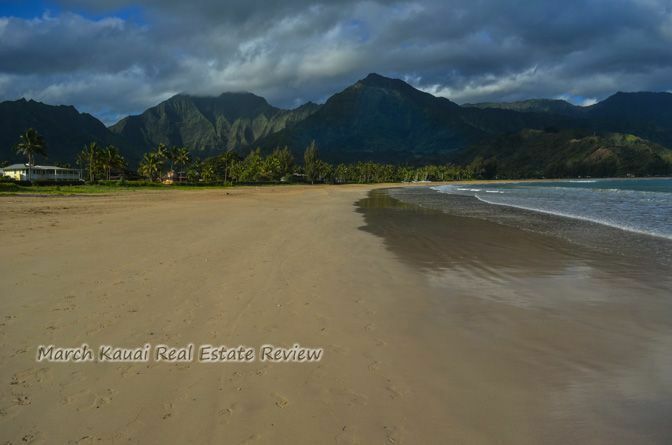 Aloha from the island of Kauai presented herewith is the Kauai real estate review for March. It has been an active month with 113 properties changing hands. No doubt inspired by the dry seasonal winter and crystal clear waters of our island home. For the Turtle Cove Realty team there were two land closures in the Koloa district. Mr. Ray Gordon sold a premier Club at Kukuiula parcel overlooking the tropical fruit orchard with unobstructed sunset views with Niihau rising from the Pacific. Ms. Lee Morey sold one of the few lots remaining in Koloa Estates with Club at Kukuiula privileges. A desirable lot that the new owner will use to add on to his adjacent property. Talk with Lee if you are interested in gaining access into the Kukuiula lifestyle while owning in Koloa Estates. A remarkable 52 homes sold in March island wide. Typically our winter high season finally convinces returning guests to own a home in one of the loveliest spots on the planet. Hanalei district led the way with 15 units sold at a median price of $1,300,000. Koloa district was a close second with 14 units sold with a median price of $657,500. Kawaihau district had 12 residential sales with a median price of $527,250. Even Waimea district had a whopping 8 sales with a median average of $360,000. Known for a more affordable residential housing market it is a great area for residents and part time residents to find a piece of the island to enjoy all that Kauai has to offer. A total of 36 units sold this past month with the condo centric Kawaihau district selling the most units at 11 with a median price of only $225,000 followed by Hanalei district with 10 units at a median price of $560,000. The Lihue distrcit came in with 9 sales with a median price of $203,000. Kauai condos offer an ease free opportunity to own on the island and have it managed by professionals. Short term vacation renting reduces overall costs when the owners are off island. Land sales spiked this month with 15 total sales on the island with buyers shaking off the logistics of finding qualified crafts people and dealing with local government demands. Lee Morey, PB is the owner of Coldwell Banker Turtle Cove Realty in Kalaheo, Kauai. She writes frequently about matters that effect Kauai real estate.